This twice baked garlic parmesan sweet potato casserole is a savory twist on a classic autumn side dish. 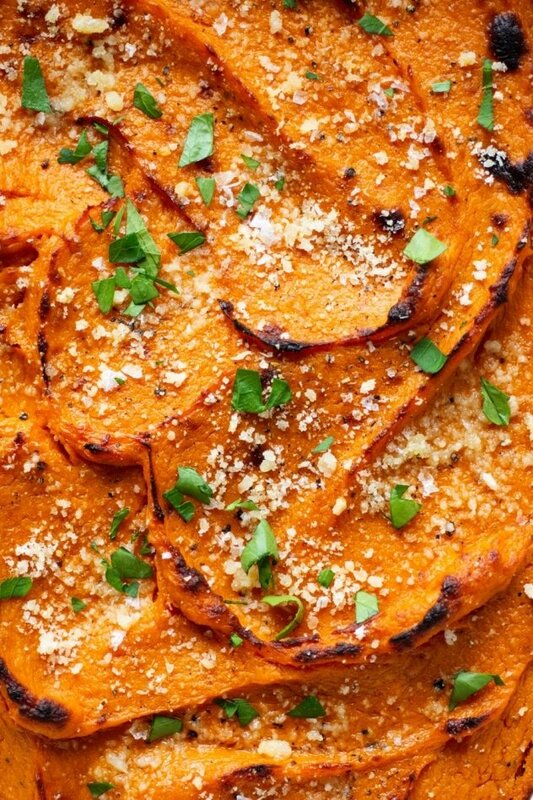 Made with smooth and luscious sweet potatoes, parmesan cheese, and roasted garlic. Nourishing, delicious, and full of flavor! Ohhh the classic sweet potato casserole. Many Thanksgiving tables would not feel complete without it. But we’re gonna do it a little different this time and take the savory route. 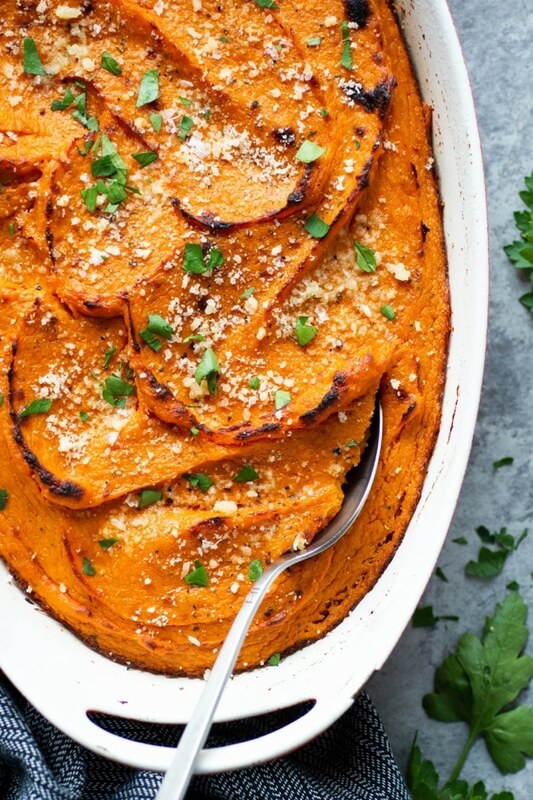 As everyone who has ever sat down to a traditional Thanksgiving table knows, typically the sweet potato side dish leans toward the sweeter side of the flavor spectrum. Ingredients like maple syrup, pecans, marshmallows (no offense but I just can’t with that last one), are the usual suspects. This recipe swaps those sweet ingredients out for more savory, punchy ones like parmesan cheese and roasted garlic. And because you still have the natural sweetness of the sweet potato you end up with a dish that hits every single note on your palate. <– YES! The recipe starts by roasting some halved sweet potatoes alongside a big head of garlic until both are sweet and tender. If you want to roast a few extra heads of garlic to have on hand for other Thanksgiving recipes now is a great time to do it. To roast the garlic all you have to do is cut off the top of each head of garlic to expose the cloves. Drizzle with a little oil and a pinch of salt and wrap tight inside a tin foil packet. When they’re done they will be tender and sweet, the heat of the oven taking away all of the bite that garlic normally has. One hour at 400 is about the right temperature and time combination, maybe a little less if your sweet potatoes are small. Once the sweet potatoes and garlic are tender, take them out of the oven to cool just enough to handle. You’ll make a quick paste from the roasted garlic by smashing the soft cloves with a fork, and scoop the flesh out of the skins of the sweet potatoes. 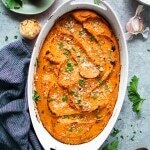 You can either mash the sweet potatoes in a large bowl with parmesan cheese, a little ghee, milk of choice (I use almond milk), and salt and pepper or give them a quick turn in a blender or food processor. Mashing them will result in a slightly more rustic, textured result, and using a blender or food processor will give the casserole a more silky smooth texture. Transfer the sweet potato and roasted garlic mixture to a greased baking dish, and then brush the top with a little extra melted ghee, butter, or avocado oil. Return to the oven to bake until golden and bubbly around the edges. If you want a nice golden crust on top, simply set the oven to broil for the last few minutes of baking. Top with a little extra parmesan and fresh herbs and you are ready to serve! 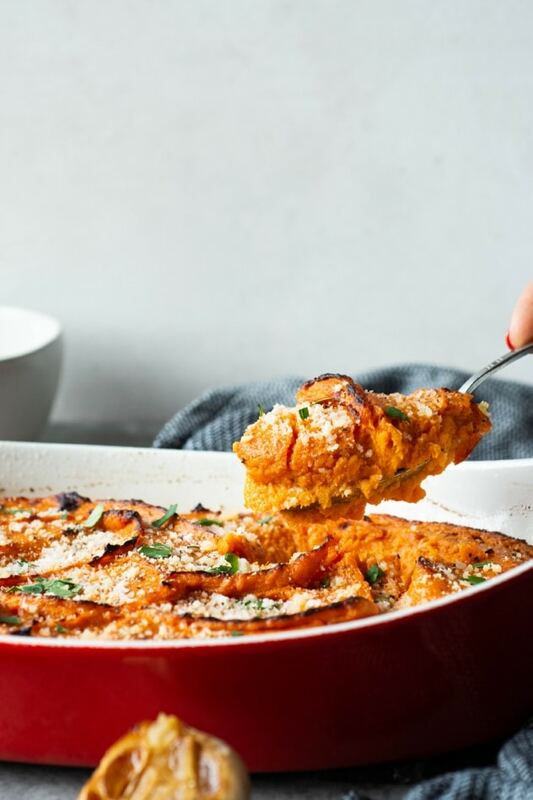 can this sweet potato casserole be made paleo? Yes! 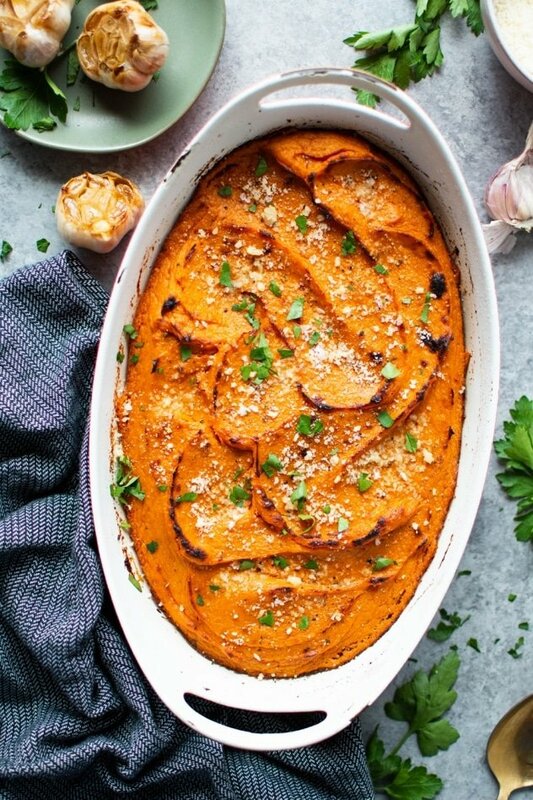 To make this twice baked garlic parmesan sweet potato casserole paleo, all you have to do is leave out the parmesan cheese and choose non dairy fats and a non dairy milk. You could add some crisped up bacon and a little nutritional yeast if you want a little something extra to make it shine. can it be made ahead of time? Absolutely. 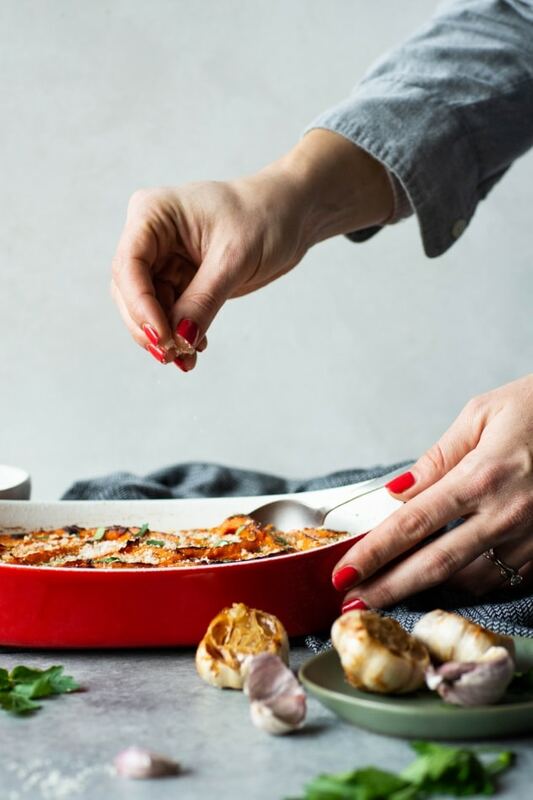 To make this twice baked garlic parmesan sweet potato casserole in advance, prepare the recipe up until the point of putting it into the oven for the second time. When you’re ready to serve, simply take the casserole out of the refrigerator and bake according to the instructions. Either allow it to come to room temperature before baking, or give it an extra 5 minutes or so in the oven to make sure it is heated all the way through. Line a baking sheet with parchment paper or a silicone mat and brush with 1 tablespoon of avocado oil or another cooking oil of choice. Cut the top 1/4 of the head of garlic off, exposing all of the cloves just a little bit. If some garlic cloves around the edge were missed you can go around and individually trim the tops off of them. Place cut head of garlic on a square piece of tinfoil big enough to wrap the garlic in. Top with a big pinch of sea salt and 1 teaspoon of avocado oil. Wrap tightly in the foil to seal. Cut sweet potatoes in half lengthwise and place cut side down on the baking mat. Place baking sheet in the oven alongside garlic packet(s) and bake for about an hour, maybe a little less if your sweet potatoes are small – until tender when pierced with a fork. When sweet potatoes and garlic are both tender and just barely starting to caramelize, remove from the oven and carefully turn them over so they’re flesh side up, to release steam and allow to cool more quickly. Open up the aluminum foil garlic packets so the roasted garlic can also cool. When sweet potatoes are cool enough to handle, scoop out the flesh into a large bowl, and discard the peels. Add parmesan cheese, almond milk, salt, and pepper. When garlic cloves are cool enough to handle, squeeze each clove onto a small plate and smash to a paste with a fork. Add smashed garlic to the sweet potatoes and mash together with a potatoes masher. A pastry cutter also works well for this. If you want a super creamy result mix briefly in your food processor or blender. 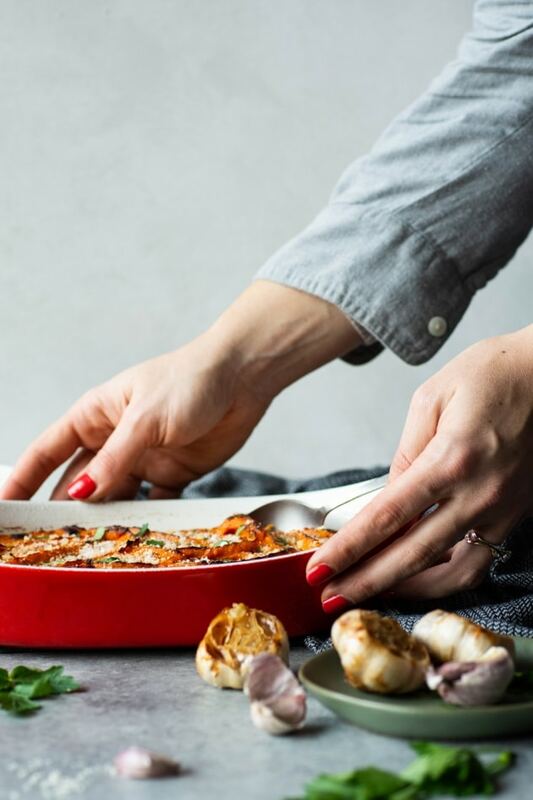 Lightly brush the inside of a 2 qt baking dish with ghee or avocado oil and transfer the sweet potatoes to the baking dish. Spread evenly. If making ahead of time, this is the point where you would store the casserole in your refrigerator until your ready to bake it and serve. Brush the top of the casserole with a little bit of melted ghee or avocado oil. Bake for about 15 minutes, until golden and bubbly around the edges. If you want a more golden crust on top, broil on high for the last 2 minutes of baking. Before serving top with a little extra parmesan cheese, fresh herbs and black pepper. Paleo option: Leave out the parmesan cheese, and use a non-dairy fat and a non-dairy milk. Yummy add in’s to punch up the flavor could be cooked and crumbled bacon, a tablespoon or so of nutritional yeast, or green onions! This entry was posted in side dishes and tagged christmas, easy, gluten free, grain free, healthy, make ahead, paleo, quick, savory, side dish, sweet potatoes, thanksgiving, vegetables side dish on November 15, 2018 by Nyssa Tanner.